We are experts at delivering high quality, tailored financial education in a fun way to help make that learning stick. Providing practical support with tools and tips to take away that can help with planning a more financially secure future. Better with Money was set up to reduce financial misery and confusion in the UK. We aim to bring money matters to life in an accessible and interesting way, delivered in the workplace to employees helping them think clearly about money so they are less stressed. We help them plan earlier for life’s ups and downs and the knowledge and tools gained from our workshops can reduce financial unhappiness, increasing people’s engagement with life, their career and workplace benefits. Better with Money has a regional team of trainers with over 100 years collective financial experience. We use our expert knowledge combined with a sense of reality and fun to keep people motivated and we take feedback from our face to face and web based courses to ensure we are constantly delivering relevant, useful and high quality content. Uniquely in our market, we promise not to sell your staff any other services or products. Our focus is to deliver independent employee education, keeping the emphasis on learning new ways to make positive changes, using real life case studies, takeaway checklists and all delivered in your own workplace. 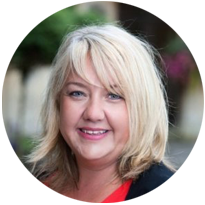 Jo Thresher is an award-winning financial services professional with almost 30 years’ experience, a trained money coach with a true understanding of the difference between what people want and what typical financial services businesses tell people. Jo’s system of challenges and workshops are tried and tested to gently push people forward to being in a better financial place without being boring or selling anybody anything! Building financial knowledge, confidence, clear thinking and resilience in your people means they are happier, more engaged, less stressed and more likely to remain with you. Most financial information is about a product or a service and doesn’t join up with an individuals life. It ignores their thoughts, reality, pressures and future dreams. Our courses aim to ensure that people bring their thoughts together and we use coaching models and tools to ensure they put them into practice.